BEIRUT - Russia's foreign minister urged Syrian President Bashar Assad to move ahead with reforms Tuesday as a way to resolve Syria's crisis, as a cheering crowd of thousands waving Russian flags welcomed the diplomat, praising his country for blocking U.N. pressure on Damascus. Syria's opposition has dismissed Assad's promises of reform as empty gestures to play for time as he tries to crush the nearly 11-month uprising against his rule. On Tuesday, regime troops renewed their assault on one of the main centers of the opposition, the city of Homs, with activists saying tanks were closing in on one of its most restive neighborhoods. Activists said at least 15 people were killed in violence Tuesday around the country. Sergey Lavrov's visit comes days after Syrian allies Russia and China vetoed a Western- and Arab-backed resolution at the United Nations that would have condemned the Assad regime's crackdown on dissent and called on him to transfer some of his powers to his deputy. The Syrian government had rejected the Arab plan as intervention in Syria's internal affairs. On Tuesday, however, Lavrov said that Russia wanted to resolve the crisis "based on positions set out in the Arab League initiative," though Syrian officials clarified that he was not referring to the league-backed resolution calling for Assad to step down, according to the BBC. "Necessary reforms must be implemented in order to address legitimate demands of the people striving for a better life," Lavrov later told Assad, according to Russian state-run news agency ITAR-Tass." Assad replied that Syria is "determined" to hold a national dialogue with the opposition and independent figures. He said his government was "ready to cooperate with any effort that boosts stability in Syria," according to the state news agency SANA. "Syria from the beginning has welcomed any efforts that back the Syrian solution to the crisis," Assad was quoted as saying. Syria: After U.N. vote fails, now what? Repeated efforts by the Arab League and Russia to broker talks have been rejected by the Syrian opposition, which refuses to hold talks amid the crackdown and says it will accept nothing less than the regime's downfall. With the conflict entering a new juncture after Russian and Chinese vetoes at the U.N. over the weekend, Western and Arab nations moved to isolate Assad while they consider giving direct aid to the opposition. Gulf nations pulled their ambassadors from Syria on Tuesday because of Assad's refusal to accept Arab proposals for ending the bloodshed. France, Italy and Spain announced they were recalling their ambassadors to Syria for consultations -- in what appeared to be coordinated European diplomatic pressure as the Russian foreign minister arrived. The U.S. closed its Damascus embassy on Monday, while Britain recalled its ambassador. The Russian and Chinese votes outraged proponents of the bill, many of whom accused Moscow of giving its main Mideast ally, Assad, freedom to escalate an already bloody campaign to stamp out dissent. Lavrov's visit to Damascus appeared aimed at showing that Moscow, which is a major arms supplier to Syria, can leverage its alliance to push Assad to resolve the crisis. "It's clear that efforts to stop the violence should be accompanied by the beginning of dialogue among the political forces," said Lavrov, who was accompanied in the visit by Russia's foreign intelligence chief. The opposition has said Assad's proposed reforms, including a new constitution and eventual multiparty elections, are a dodge aimed to keep his hold on power. In the talks, Assad told Lavrov that Russia's position has played "a key role in saving our motherland," according to ITAR-Tass. Meanwhile, in Syria's central city of Homs on Tuesday, where troops have been waging a campaign for weeks to root out army defectors and protesters, regime forces attempted to storm several rebel-held neighborhoods, including Baba Amr, Khaldiyeh and Bayada, activists said. An activist said tanks were closing in on Baba Amr. "The shelling has been going on for days and the siege is getting worse. We are short of everything including food and medical supplies," said an activist who identified himself only by his first name, Omar. "People here have not slept for days." The British-based Observatory for Human Rights said at least nine civilians were killed in the shelling. It also reported that a 15-year-old boy was shot to death by security forces who stormed the town of Houleh, in Homs province. Homs was the site of the deadliest assault of the uprising on Saturday, when activists reported more than 200 people were killed in an overnight bombardment hours before the U.N. vote. The government denied the deaths. Syria has blocked access to trouble spots and prevented independent reporting, making it nearly impossible to verify accounts from either side. Despite Assad's barring of most foreign journalists, CBS News correspondent Clarissa Ward has been able to sneak into an unnamed town in northern Syria, where she has met with fighters from what they call the Syrian Liberation Army. The rebel fighters are also worried that the Syrian Army, which already overmatches them with tanks and artillery, will also start using air power in the regime's intensifying crackdown. The Observatory and the Local Coordination Committees activist network also reported heavy machine gun fire in the rebel-controlled Damascus suburb of Zabadani, saying five people were killed. The state SANA news agency said three mortar shells struck the Homs refinery, one of the country's two oil refineries, blaming "armed terrorist groups" for the shelling. It did not say whether the shelling resulted in damage. It also said armed groups attacked several security checkpoints in Homs Tuesday. 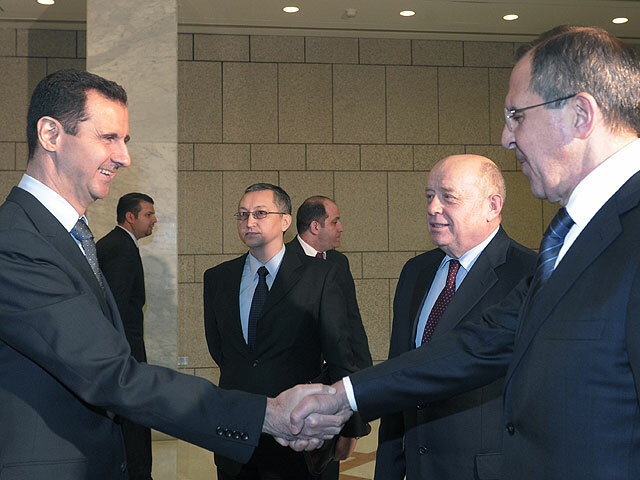 Back in Damascus, Lavrov received a raucous welcome. The Russian diplomat's convoy snaked its way along Damascus' Mazzeh boulevard among a sea of Assad supporters cheering Moscow's stance at the U.N.
"Thank you Russia and China," read one banner that had the photos of both Assad and the Russian president. Many stood under rain carrying Syrian flags as well as the red, blue and white Russian banner. "I am here to thank Russia for its stand in the face of the world conspiracy against Syria," said Manya Abbad, 45, as she waited for Lavrov's convoy. "I wish the Arabs adopted similar stances." The Assad regime says terrorists acting out a foreign conspiracy to destabilize the country are behind the uprising, not people seeking to transform the authoritarian regime. More than 5,400 people have been killed in Syria since the uprising began in March, according to a U.N. count from early last month. Hundreds more are believed to have been killed since then, but the U.N. says the chaos in the country has made it impossible to cross-check the figures. Turkey's Prime Minister Recep Tayyip Erdogan said his country cannot remain silent about the massacres in Syria. He said Turkey will "launch a new initiative with countries that stand by the Syrian people instead of the regime." His comments reflected a growing movement by the U.S., Europe and countries in the region to organize a coalition of nations to give support for Syria's opposition, though what kind of support remains unclear. Over the weekend, U.S. Secretary of State Hillary Rodham Clinton called for "friends of democratic Syria" to unite and rally against Assad's regime. The recall of ambassadors by the six-nation Gulf Cooperation Council reflected the move by Western and Arab countries to definitively turn their back on Assad. The GCC, which includes Sunni powerhouse Saudi Arabia, as well as Bahrain, Kuwait, Qatar, Oman and the United Arab Emirates, also said it was asking Syria to recall its ambassadors.